The Canadian Down Syndrome Society (CDSS) is a national non-profit organization providing information, advocacy, and education about Down syndrome. CDSS supports self-advocates, parents, and families through all stages of life. The Canadian Down Syndrome Society is a Registered Charitable Organization (Canada Customs and Revenue Agency Business Number 11883 0751 RR 0001). 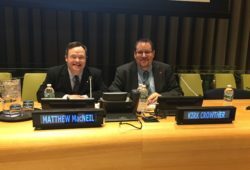 Read the official position of the Canadian Down Syndrome Society on controversial or special issues surrounding Down syndrome. Meet the dedicated board members and committees who guide the Canadian Down Syndrome Society, their nomination process and expectations. Read the latest press releases from the Canadian Down Syndrome Society, download the Media Kit and meet the media contact. Find all the contact information for the Canadian Down Syndrome Society and get in touch with us today. A self-advocate-led committee called VATTA (Voices At The Table for Advocacy), which advises CDSS on what is important to the community. Publications, including our community newsletter written by and for people with Down syndrome. Resources like the New Parent Package, Educator Package and Mind & Body: Answers To Your Questions are available in digital and print formats. Where possible, our resources are also available in French. Our e-newsletter, which keeps members and donors up to date on what’s new in the community and at CDSS, and celebrate stories from around the world. Exclusive resources from CDSS in various fields, supporting all life stages of a person with Down syndrome. 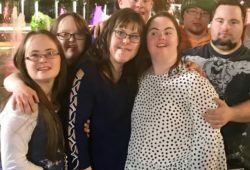 Network of over 50 Down syndrome groups in Canada. All people are valued, fully participating citizens. To empower Canadians with Down syndrome and their families. We raise awareness and provide information on Down syndrome through the prenatal, early childhood, school years, adulthood, and retirement stages of life.